“Can I recycle this container?” is a question we often get asked. It seems that everyone knows you can recycle plastic bottles, pop cans and beer bottles in BC for a deposit refund! But did you know that these items shown below can be recycled too? Ok, you don’t get any money back for recycling these. (That’s because you don’t pay a deposit when you purchase them.) But hey, that doesn’t mean they should go in the garbage or trash! Since these containers are recyclable, bring them to us the next time you do your other recycling. We will happily take your plastic milk and milk-like containers of all sizes. 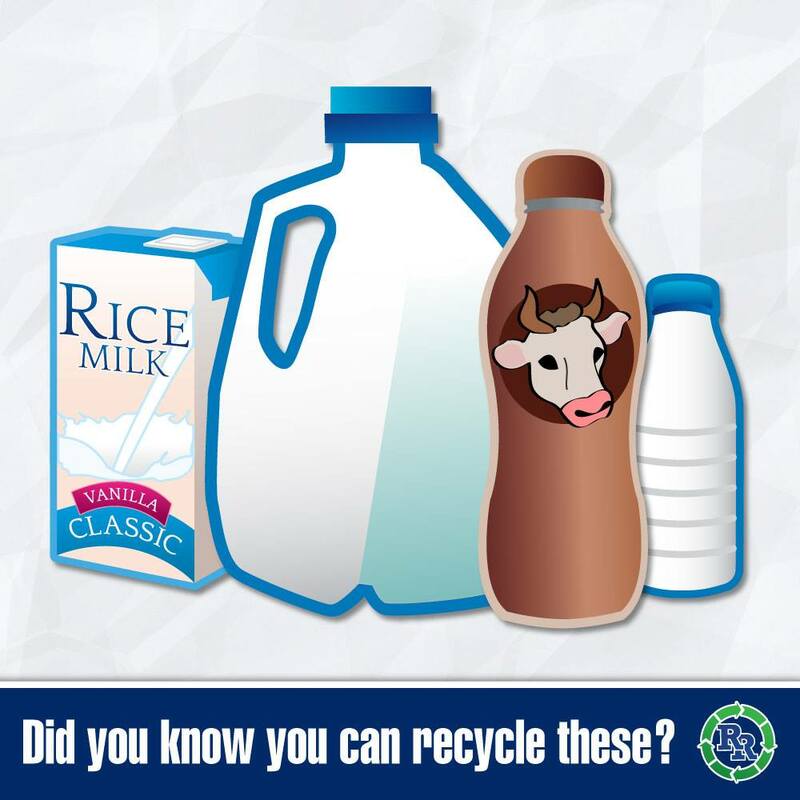 Recycling of these types of containers – milk jugs, plastic milk bottles of all sizes and non-dairy milk substitute cartons (called gable-top containers) – is important, as it keeps the plastic contained in these beverage containers out of landfills, our waterways, and ultimately out of our food systems as well. These items can be recycled, so please do, even if you don’t get any cash back for doing it. 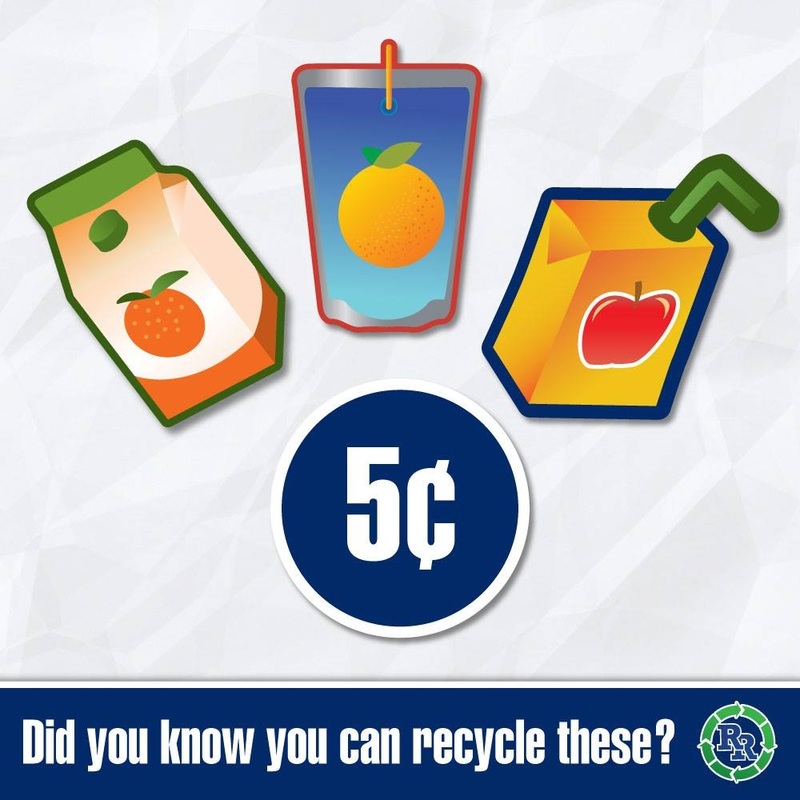 Juice boxes can all be recycled, and you receive a deposit refund for all of them. How much you get back depends on the size of the box. The refunds range from 5 – 20 cents per container, so it can add up! If your family drinks a lot of juice you could be throwing money out the window if you don’t recycle these! The juice category includes things like drink pouches, larger juice cartons (gable tops) and the convenience-sized juice containers. Because you can break these items down or “smush” them into a smaller size it’s pretty easy to collect enough to make a trip to the recycle depot worth your while. Please remember to rinse the containers out to discourage pests and eliminate the smell. Don’t care about the cash back? DONATE your containers to a local homeless person OR bring them in to our depots to drop in our monthly donation bins. 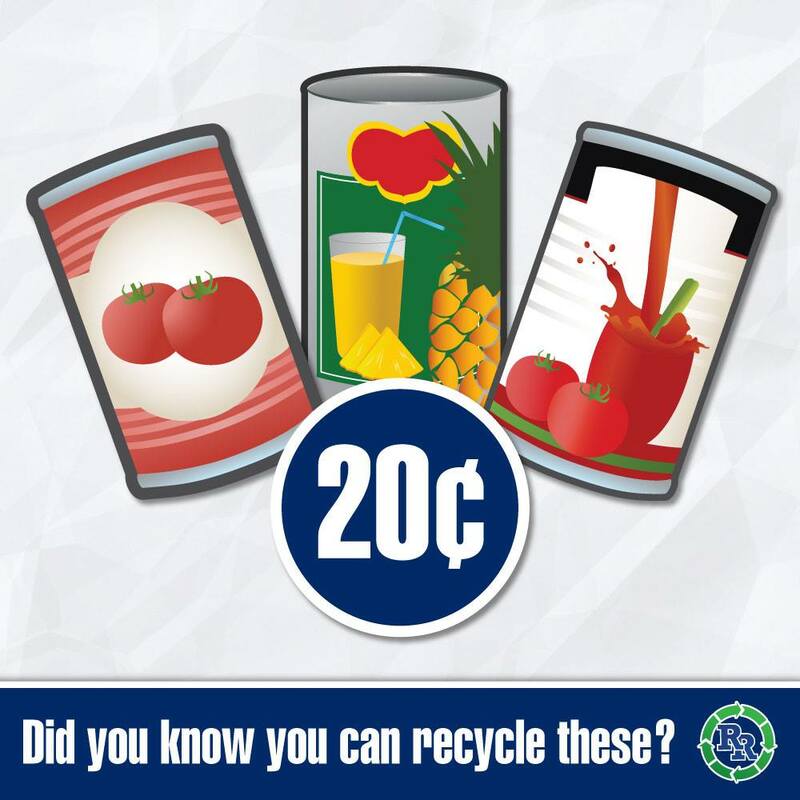 Juice cans are recyclable (leave the label on if you want a deposit refund). 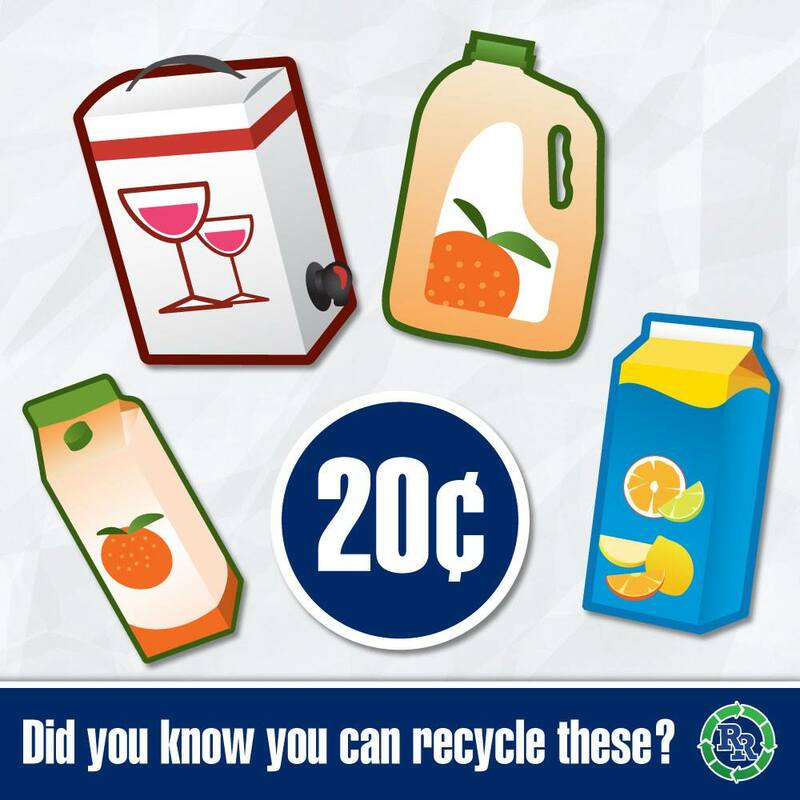 One Litre juice cartons and juice bottles are worth 20 cents a piece, so collect those to bring in to us too! Encorp’s rules are pretty strict about the labels – they have to be left on if you want a deposit refund on your juice tins. Yes, that’s right. Wine in a bag containers are recyclable too, and you get 20 cents per when you bring them in for recycling. Like all liquor containers you purchase in BC – beer bottles, wine bottles and liquor bottles – you pay a recycling deposit when you buy wine in a box. So, that means you get that money back when you return the containers for recycling, just like you do with beer bottles, wine bottles and liquor bottles. Collect your alcoholic beverage containers year-round and bring them in to us to get your full deposit refunded to you. Many people don’t know that some of these containers are recyclable, and end up throwing them in the garbage! Next time you ask yourself “Can I recycle this container?” remember this graphic or save the link to our what you can recycle web page. You can also find more information on Encorps beverage recycling page. We have recycling locations in Abbotsford, Burnaby, Cloverdale (Surrey), Richmond, Nanaimo, Vancouver and Whistler.